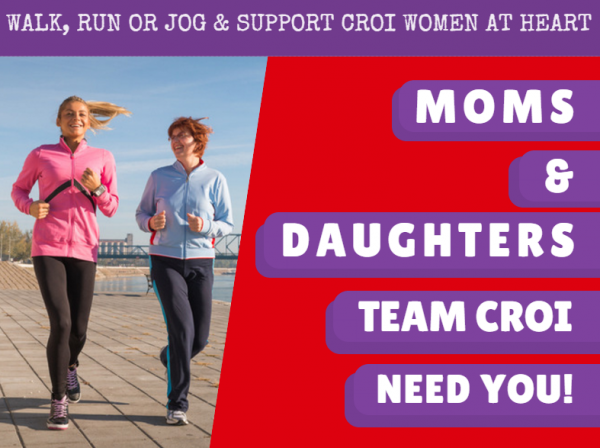 CALLING Moms & Daughters… Team Croi Need You! CALLING MOMS AND DAUGHTERS… CROI NEED YOU! Croí Heart & Stroke Charity are calling all moms and daughters to wear red for Croí Women at Heart this June, and walk, jog or run the annual VHI Women’s Mini Marathon in Dublin. The 10km event, which takes place Monday 5th June 2017, is the biggest women’s event of its kind in the world! We’re looking to bring a team of 50 fabulous ladies to Dublin and help raise awareness and funds for Croí Women at Heart. The face of heart disease is changing. Once considered ‘a man’s disease’; the number of deaths from heart disease and stroke are now virtually the same for men and women. Women at Heart is a campaign by Heart & Stroke Charity Croí to educate and empower women to make their heart health a priority. The aim of the Campaign is to highlight the prevalence of heart disease & stroke among Irish women. 1 in 2 Irish Women will die of cardiovasular disease. 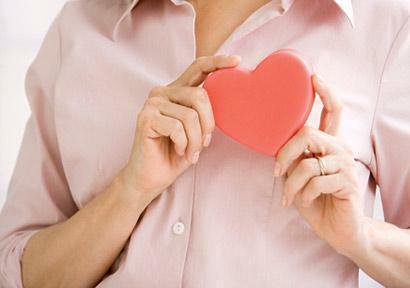 Irish women are 7 times more likely to die from cardiovascular disease than breast cancer. Almost 5,000 Irish women die every year from cadiovasucalar disease. That’s 5,000 families without a mother, sister, aunt, niece, gran – a loved one! 90% of heart disease & stroke is preventable through lifestyle change and risk factor modification! The Vhi Women’s Mini Marathon is the biggest all women’s event of its kind in the world. It has grown from its beginnings in 1983 with almost 9,000 participants to a staggering 41,006 women participating in 2014. It is the biggest all-women’s event of its kind in the world! Since it was first run in 1983, there has been a total entry of nearly 958,000 women. Women of every age and every walk of life take part -while the majority would be in the 25 to 45 age brackets, in the 2015 race there were more than 379 participants over 70 years of age! If you are interested in taking part in this event you must register direclty with the organisers (registration open 1st March). or email saraburke@croi.ie for a sponsorship card. Join this fun event and help raise money for Croí Women at Heart campaign and help fight heart disease in women! Posted in NewsLeave a Comment on CALLING Moms & Daughters… Team Croi Need You! Whisk the milk and lemon juice and allow to sit for two minutes. Whisk in with the egg, melted margarine and bananas. Sieve the dry ingredients into the milk mixture. Mix until everything is fully combined. Place the blueberries, honey and water in a small pot and simmer until soft. Heat a pan with a small amount of oil. Fry the pancakes until bubbles rise to the top. Turn over and fry until golden brown. 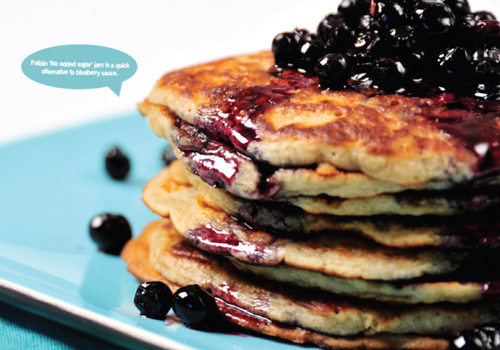 Serve stacked with the blueberry sauce. Adding fruit to pancakes will help towards achieving your 5-a-day. For example; 1 medium banana or 1/2 cup of blueberries counts as one serving of fruit! Croi will be attending the 2nd Annual Patient Adherence and Engagement Conference in May. Chronic illnesses are commonly treated with the long-term use of medications. This treatment could be successful, however, its benefits are overshadowed by the fact that 50% of patients don’t take their medications as prescribed. Reveal all the alarming numbers of non-adherence and learn how to decrease it with improved patient engagement. An Irish Air Corp Helicopter landed at Galway University Hospital this week with a big cheque for local Heart & Stroke Charity Croi. The majority of Air Corp landings at Galway University Hospital are carrying patients from the west of Ireland who have experienced heart attacks and who are in need of emergency specialist cardiac care. It’s no surprise therefore that members of the Air Corp who regularly land in Galway decided to support Croi with the proceeds of a recent fundraising event they participated in. 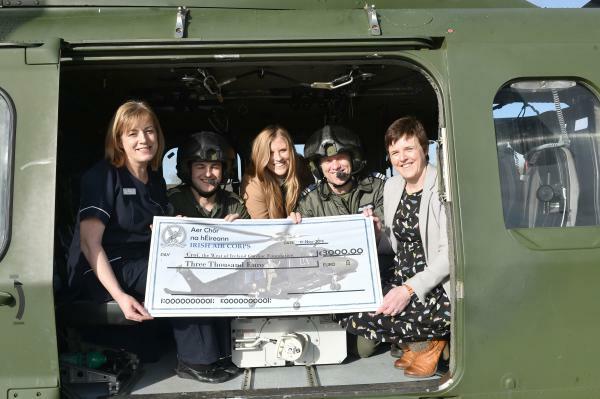 Pictured at the presentation of proceeds from a recent fundraising event by members of the Irish Air Corp in aid of local Heart & Stroke Charity Croi are (left to right): Maeve Frawley CNM 11 Coronary Care Unit GUH; Airman Paul Mackey EMT; Sarah Burke, Croi; Comdt. Phil Bonner Irish Air Corp and Edwina Treacy, Croi. Galway Man Enters New York Record Books! Galway man Tommy Holohan has earned himself a place in the record books of the New York City Marathon where he now joins an elite group known as ‘Streakers’ – a title given to anyone who completes 15 or more New York City Marathons. Over the past number of years, Tommy who is from the Calddagh in Galway has completed 20 New York City Marathon, many of which he participated in to raise funds for local Heart & Stroke Charity Croi. To recognise this achievement Tommy was recently presented with a token of appreciation from Croi at a small reception attended by his family. Furthermore, on this occasion Tommy received a surprise presentation from an American Lady, Fern Howe Balaun who has been following his fundraising efforts over the years and who came to know Tommy when she began tracing her ancestry back to the Claddagh. Ms Howe Balaun arranged for Tommy to be presented with a very rare and old book on Galway’s famed Claddagh. 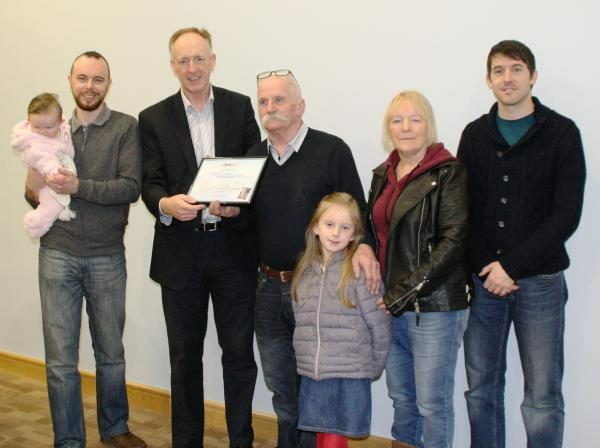 Pictured at a special reception to acknowledge the fundraising efforts of Tommy Holohan and his entry into the record books of the New York City Marathon where he is one of only 79 people who have completed the event 20 times, photo shows (left to right): Eddie Holohan and his daughter Katie, Neil Johnson Croi, Tommy Holohan, his grand-daughter Zoey, his wife Maura and son Billy. Posted in NewsLeave a Comment on Galway Man Enters New York Record Books! People who have excess body fat, especially around the waist area are more likely to develop heart disease and stroke even if they have no other risk factors. Reducing excess weight can help reduce your heart disease risk. The most successful way of losing weight is by having a healthy balanced diet, managing portion sizes and increasing physical activity. Try not to lose weight too quickly – fad diets are often far-fetched. They can be difficult to keep to in the long term and can be very unbalanced, and bad for your health. Losing weight slowly, about one to two pounds (between half a kilo and one kilo) a week is healthier, and you are more likely to keep the weight off for good. Do not skip meals. Start the day with a healthy breakfast. Eating 3 meals per day helps your body have energy it needs and it prevents hunger. Control your portion size. Use a standard 9 inch plate, avoid bigger plate sizes. Eat when hungry. Avoid eating to relax, or because you are bored or depressed. Take a walk or do something you enjoy instead. Download the Croí food diary and fill it in for a few days. Limit sugar and sweets. Desserts have many calories and few nutrients. Drink plenty of water. Aim for a minimum of 6-8 glasses (2 litres) of water each day. Choose healthy snacks. Enjoy fresh fruit, vegetables, or low fat yogurt instead of packaged snacks. Regular physical activity – aim for 30 minutes, 5 days a week. This ensures a balance between the energy you get from food and the energy you use. Posted in NewsLeave a Comment on What is the best way to lose weight? Pull skin off the chicken and disguard. Heat the oil in a large casserole dish, brown the chicken all over, then remove with slotted spoon. Tip in the onions, garlic and chillies, then fry for 5 minutes until starting to soften and turn golden. Add the pepppers, tomatoes, beans and hot stock. Put the chicken back on top, half-cover with a pan lid and cook for 50 minutes, until the chicken is cooked through and tender. 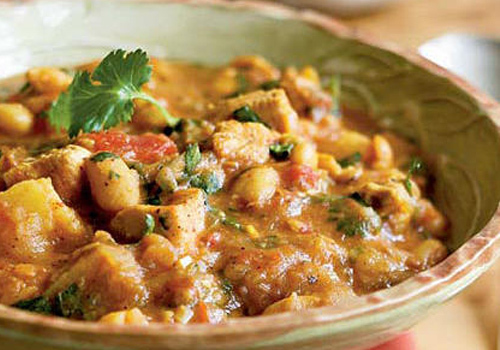 Stir through the coriander and serve with low fat creme fraische and crusty bread, mashed potato or rice. 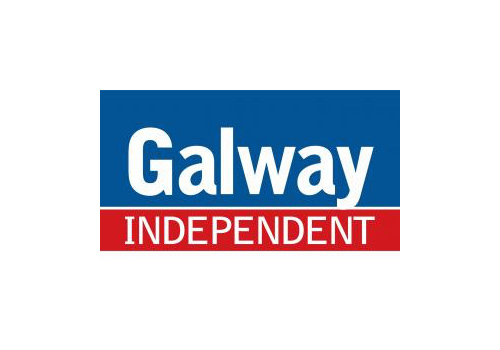 First published in the Galway Independent 1st Feb 2017.